Even though gothic culture can take your mind to dark and gloomy elements, this doesn’t mean you can’t use it in your home as a decorating style. A gothic theme doesn’t necessarily have to make your home feel spooky and sinister. It’s actually the best style if you value the old-style elegance as the gothic design makes use of dark colors and ornate elements to create an opulent Victorian look. There are many ways to use gothic elements to decorate your home. You don’t really have to stick to one particular style such as traditional or Victorian. You can also choose more modern variations like the gothic vampire or romantic themes. If you’re short on inspiration, this article will help you figure out the best methods for incorporating the Gothic style in your home décor. 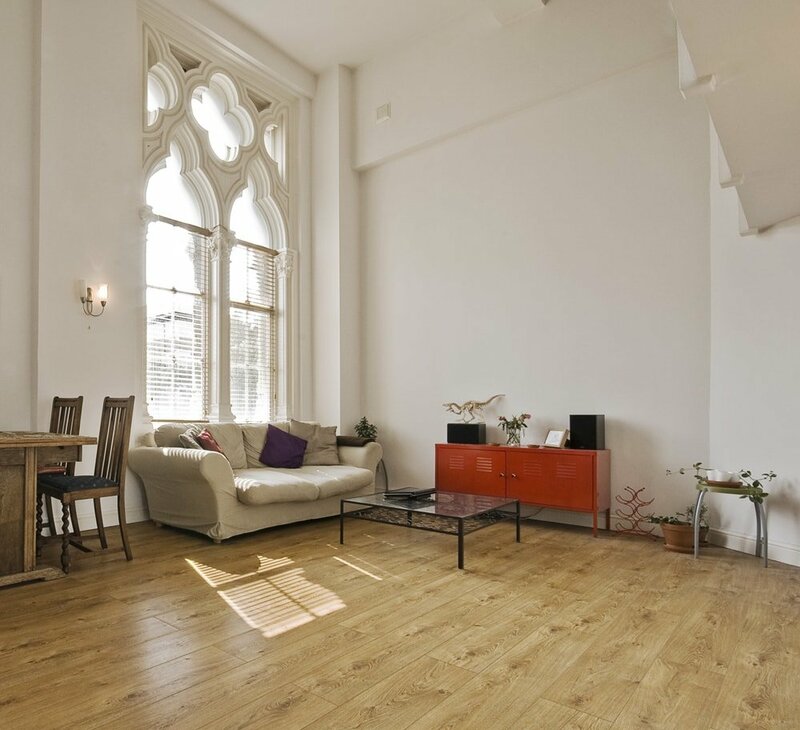 Traditionally, the Gothic style boasts some particularly intricate architectural features. The core idea behind gothic architecture is bringing out the primal qualities of any design element. Arcs, moldings, and other details should focus on delivering a castle-like atmosphere. Some good examples for the ideal architecture of the Gothic style are pointed arches and ribbed vaults. Walls will probably require a special aging treatment to resemble the look of the medieval period. This can be achieved through faux painted stones. The palette should include gray and beige shades combined with blacks for the outlines. Another option is to use wallpapers and here you should try to go for a dramatic look. Intricate patterns and velvet textures work best for wallpapers whereas tapestries or fabrics can be hanged from generous heights. An important feature of the Gothic style architecture is the ‘pointy’ look that’s obtained from various ornate elements. This design choice was something of a novelty at the time when the Gothic style has been devised. With the help of symmetry, the interior space has been elegantly balanced. There’s also an ecclesiastic influence to the Gothic style which is understandable given the power of the Catholic church in that era. Before going over some creative ideas, it’s important to emphasize the essential role of elegance in the Gothic style. If you wish to decorate your home using gothic elements, you need to understand the effect this style has for the look of your home. This is definitely not a decorating style that’s easy to work with considering how it requires bold pieces and high-end fabrics. The furniture, for example, needs complex styling with intricate ornate designs and many details. 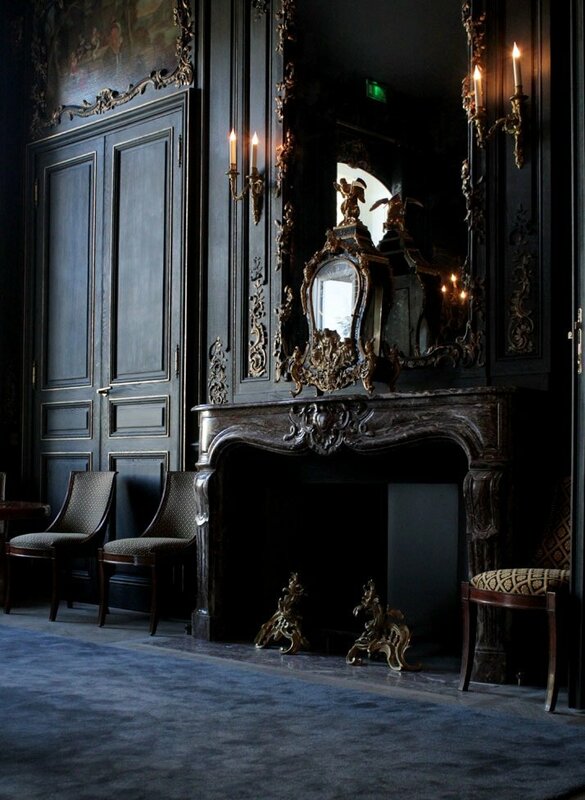 The Gothic style is the ultimate interior design choices for those who value elegance above all else. The high-end drama look may not be for everybody and that’s not just considering individual taste, but also when taking into account budget concerns. Still, there’s no need to worry too much about this aspect as you don’t need lots of grand elements to obtain the desired effect. Perhaps you only wish to try a sample of this style so in that case, just a large chandelier with small decorative changes should suffice. 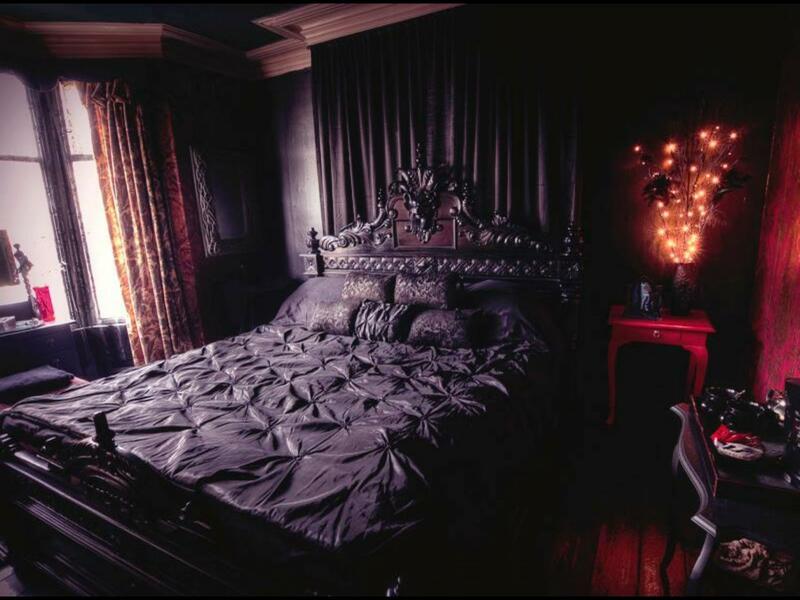 In terms of colors, the obvious choice to make your room seem more gothic in style is to add plenty of blacks. While that’s usually a good idea, it’s important to avoid excessive use of black elements as you can create a stereotypical dark mansion. 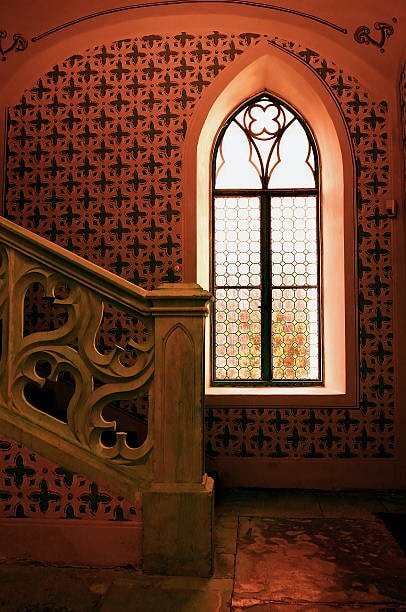 For this reason, it’s important to find some rich, dramatic colors that feel at home in the Gothic style. Some good examples are vibrant shades of emerald green, burgundy, and ocean blue. Keep the dark look balanced with more earthy shades from wood and brick materials. 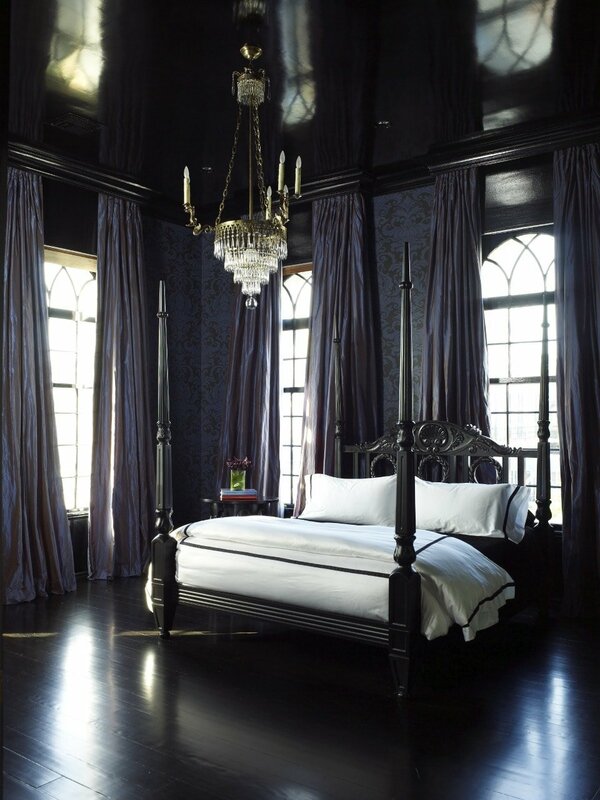 As it’s been previously mentioned, high-end fabrics shouldn’t miss from any gothic home. Therefore, it’s best to focus on materials such as silk, velvet, and satin. The general impression should be of glamour and decadence. Silk or velvet curtains will definitely be able to make an imposing statement. The same thing can be said about upholstery. Satin works great for bedding and pillows. The Victorian Gothic home relies a lot on tapestries because textiles offer the sort of vintage elegance that’s characteristic of this style. 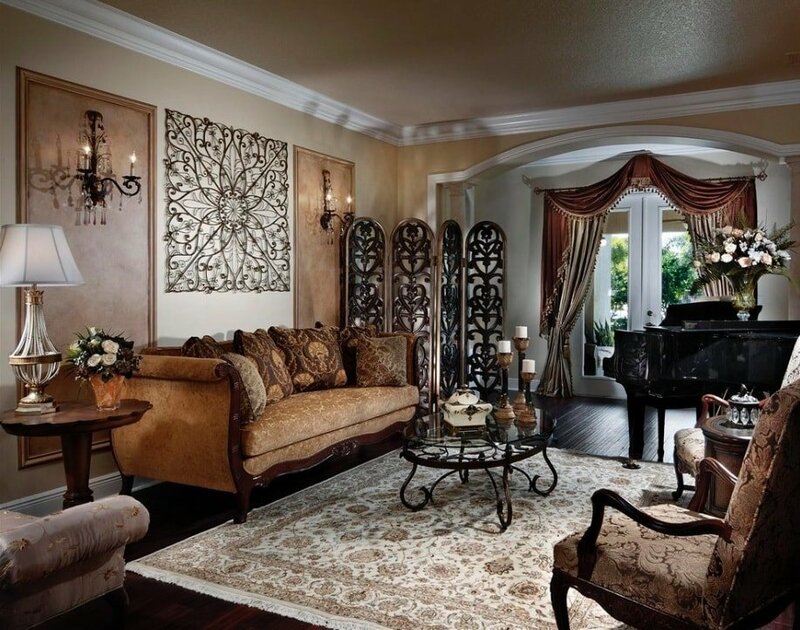 Exceedingly large tapestries create the best gothic effect, but you will also need to have tall walls, so this may not be a great option for smaller homes. Fabrics for the draperies aren’t hard to choose. The more difficult part is figuring out which design works best with the Gothic style. It’s recommended to go for long and heavy drape panels as they provide a more majestic atmosphere. In the Victorian era it was important to have such long curtains to ensure drafts weren’t penetrating inside the house. Nowadays that’s not really an issue, but the decorative effect shouldn’t be overlooked. Long draperies can also be used as room dividers if you want an extra touch of elegance. The dining room would look really good with its doorway frame covered by a long curtain panel. When it comes to details, try to go for more opulent looking draperies with tassels and tiebacks. Remember how important it is to create a dramatic effect. Some well-placed accessories are welcomed in the Gothic style of interior design. Ornate pieces with intricate embellishments work best and try to emphasize items built from heavy wrought-iron. Other materials that you should strongly consider are wood and stone. Some great examples are pottery bowls or wrought-iron candle holders. Here’s a stylish model we like from Amazon. If you want your gothic home to look extra fancy, try searching for some ornate stone statues and expansive rugs. The last piece that completes your gothic-themed home could be a gargoyle stone statue like this one found on Amazon. Plants can also act as good decorations for this style, especially if you prefer a more romantic flavor. Make sure you select an appropriate plant pot in a contrasting shade if you go for white flowers. We’ve mentioned candle holders previously as they make great accessories in the gothic home. The main reason for that is due to the importance of candle lighting in this style. If you want an authentic castle-like atmosphere what better way is there than using lots of candles? Obviously, you can’t exclusively rely on candles for lighting, so you should try to simply take advantage of their decorative potential only where possible. 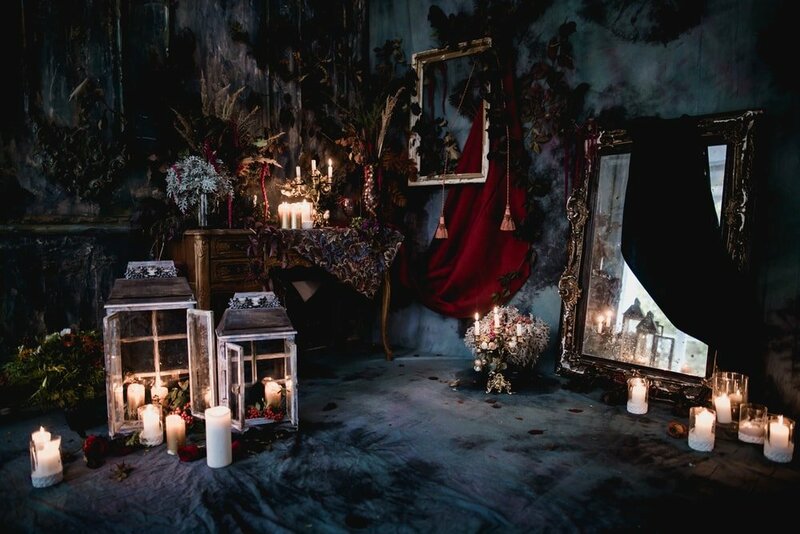 Whether scented or unscented, candles can bring a superb effect for outfitting your home in gothic fashion. There are lots of interesting gothic lighting solutions on the market, but try to focus on more ornately carved lamps. You can get more creative when it comes to finding a good balance between powerful illumination and old-world looks. 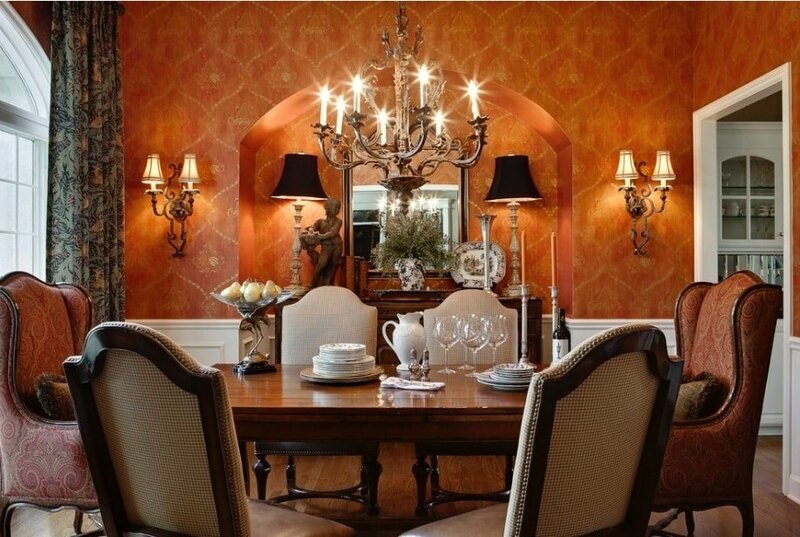 For example, you can add light bulbs that mimic candle flickering to your large wrought-iron chandelier. An antique crystal-beaded chandelier that we like is this model from Amazon. 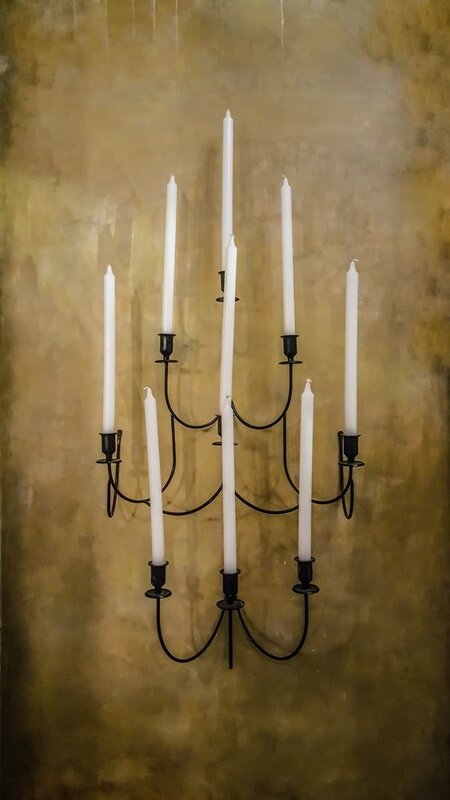 With its sturdy wrought-iron frame, it fits great in any gothic-styled home. Lancet windows represent a common motif found in gothic churches. If you manage to integrate this type of window in your home you will definitely be pleased by the effect. A lancet window is tall and narrow with an iconic shape which can be successfully integrated into your interior walls. The pointed arch of this type of window can be mimicked by mirrors or artwork if redesigning your windows seems too complicated. If you can’t find an authentic lancet window, a modern mirror with a similar design can add a stylish gothic flavor to your living room. Details are important in the Gothic style, and the more intricate, the better. An easy way to add texture and elegance is by relying on moldings when considering the architecture and other design elements. Having molded panels on the walls represents a good example. Another one is to consider adding some majestic molding lines on the edge of the ceiling. If you’re into DIY work, molding can give you some great opportunities to put your skills to good use. Even if that’s not the case, you can hire a contractor to make your home looks more gothic in style. With moldings, you can get very creative and they should integrate nicely along your other gothic ornamentations. If you liked our article don’t forget to share it. You might also like our articles about steampunk decor ideas and the best home bars.